Sometimes facials include hand and foot treatments. 4 Are There Ways to Get Rid of Blocked Pores on My Face? Facials fall into two categories: the relaxing kind and the restorative kind. Women enjoy the soothing music, yummy-smelling scrub and facial massage that come with a relaxing facial. However, some facials do far more than polish the surface. 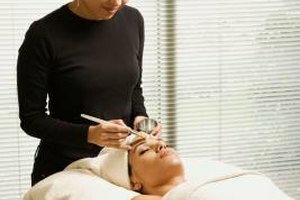 A chemical peel or microdermabrasion exfoliates dead skin cells, helps banish blemishes and reduces the effect of harmful toxins, but they can be harsh on the skin. Because of this, some women experience red marks, peeling and blotchiness immediately afterward. When this happens you can take steps to reduce redness and put your best face forward again. Ask your cosmetologist or dermatologist how long the redness is expected to last. Depending on the treatment you have, redness can last anywhere from a couple of hours to a few days. If you don't already wear facial sunscreen with an SPF 30, do so immediately after a facial. Otherwise, the sun's harmful rays can chap your skin even further and leave the redness more apparent for days to come. Apply a cold compress to your face several times a day. The coldness calms the skin and helps banish the inflammation. Put a dry washcloth in a plastic bag, place it in the freezer and then apply the washcloth to your face while lying down for as long as it stays cold. You can also wrap ice in a towel; keep the towel on your face for one minute and then take off for five minutes. Avoid a hot shower or steam immediately after a facial that leave red marks. Use products with anti-inflammatory ingredients such as oatmeal, cucumber, licorice, aloe vera and chamomile. While you'll want to skip using any kind of facial scrub for the time being, you can use other products such as a mild facial cleanser, toner or moisturizer with these healing ingredients. Chill your moisturizer in the refrigerator so it acts as a calming agent when applied. Avoid skin care products with menthol, alcohol or fragrance as these can irritate the skin and worsen the redness.